AKRON, OH--(Marketwire - January 17, 2008) - Akron Children's Hospital will premier a live, one-hour Webcast on www.OR-Live.com about arthroscopic surgery to stabilize a dislocated shoulder on Thursday, Feb. 21, 2008, at 5 p.m. The Webcast will feature video of a high school football player undergoing a Bankart repair, followed by a live, interactive panel discussion with Akron Children's Hospital's orthopedic surgeon Kerwyn Jones, M.D., and sports medicine director Joe Congeni, M.D. Pediatric orthopedic surgeon Todd Ritzman, M.D. will serve as the moderator of the panel, and viewers are encouraged to e-mail questions to the panel during the Webcast. "Shoulder dislocations are common injuries in collision sports such as football, wrestling and lacrosse," said Dr. Jones. "The shoulder joint, which is attached to a small socket, is very mobile. But it's like a ball sitting on a golf tee. While it has a lot of mobility, it's not that stable." There are two types of dislocated shoulders. The first one is caused by traumatic injury in which the shoulder ligaments tear away from the bone, causing the shoulder to pop out of place. This is called a Bankart lesion, and surgery is typically required. The second type is called multi-directional instability because the shoulder can slip out of place in more than one direction. This type of shoulder problem is usually present in girls who are loose-jointed and can intentionally slip their shoulder in and out of place. Over time this activity stretches the ligaments and capsules to the point the shoulder begins to pop out of place too easily. However, unlike a Bankart lesion, few with multi-directional instability need surgery. Instead, most can be treated with physical therapy by strengthening the rotator cuff and muscles attached to the scapula, or shoulder blade. "The younger a patient is at the time of his first dislocation, the more likely he is to suffer further episodes," Dr. Jones said. "Sometimes it doesn't even take much to dislocate it a second time. It may just be caused by reaching overhead or moving too quickly. Without surgery, studies show about an 80 percent chance of recurrence in shoulder instability caused by injury." Most Bankart lesions can be repaired arthroscopically in as little as an hour and a half. 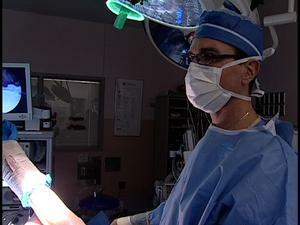 The surgery involves three small incisions. One is a portal through the back for the camera, or arthroscope. The orthopedic surgeon works through the other two portals in the front of the shoulder. "During surgery, I drill three small holes in the bone near the labrum (tissue surrounding the socket)," Dr. Jones said. "I then clean the area and remove loose bodies. I reattach the labrum (ligament) to the socket with bioabsorbable anchors, which resemble fishhooks. The incisions are then closed with small bandages." Physical therapy is key to recovery after surgery. Rehabilitation takes time, though, because patients must regain range of motion gradually so as not to stretch the ligaments before they're fully healed. This process takes about four to six months. "In order to return to normal or high level activity after a Bankart repair, athletes must demonstrate adequate strength, flexibility and endurance," said Dr. Congeni. "Return to intense activities takes longer because you have to also allow enough time for the tissue to heal." Recurrence rates of dislocated shoulders after surgery are about 4 percent. Visit: http://www.or-live.com/akronchildrens/1838 to learn more and view a program preview.